The term "Skunk Works" came from Al Capp's hillbilly comic strip Li’l Abner, which was popular in the 1940s and '50s. The “Skonk Works" was a dilapidated factory located on the remote outskirts of Dogpatch, in the backwoods of Kentucky. According to the strip, scores of locals were done in yearly by the toxic fumes of the concentrated "skonk oil", which was brewed and barreled daily by "Big Barnsmell" (known as the lonely "inside man" at the Skonk Works), by grinding dead skunks and worn shoes into a smoldering still, for some mysterious, unspecified purpose. The original Lockheed Advanced Development Projects Division was set up during WWII in a circus tent adjacent to a foul smelling plastics factory. Irv Culver, a Lockheed engineer referred to the facility as "Skonk Works". As the division was secret, employees were cautioned to be careful even when answering the phone. When the Department of the Navy called trying to reach the Lockheed management for the P-80 project, the call was transferred to Culver’s desk. Culver answered in his trademark fashion of the time, picking up the phone and stating "Skonk Works, inside man Culver". "What?" replied the voice at the other end. "Skonk Works", Culver repeated. The name stuck. Culver later said at an interview conducted in 1993 that "when Kelly Johnson heard about the incident, he promptly fired me. It didn’t really matter, since he was firing me about twice a day anyways." Lockheed changed the name of the advanced development company to "Skunk Works" in the 1960s at the request of the comic strip copyright holders. The name "Skunk Works" and the skunk design (found inside the O of our logo) are registered trademarks of the Lockheed Martin Corporation. Lockheed is a sponsor of the Skunk Works FRC team 1983 robotics team. Since its origination with Lockheed's Skunk Works, the term was generalized to apply to similar high-priority R & D projects at other large organizations which feature a "small team taken out of their normal working environment and given exceptional freedom from their organisation's standard management constraints." 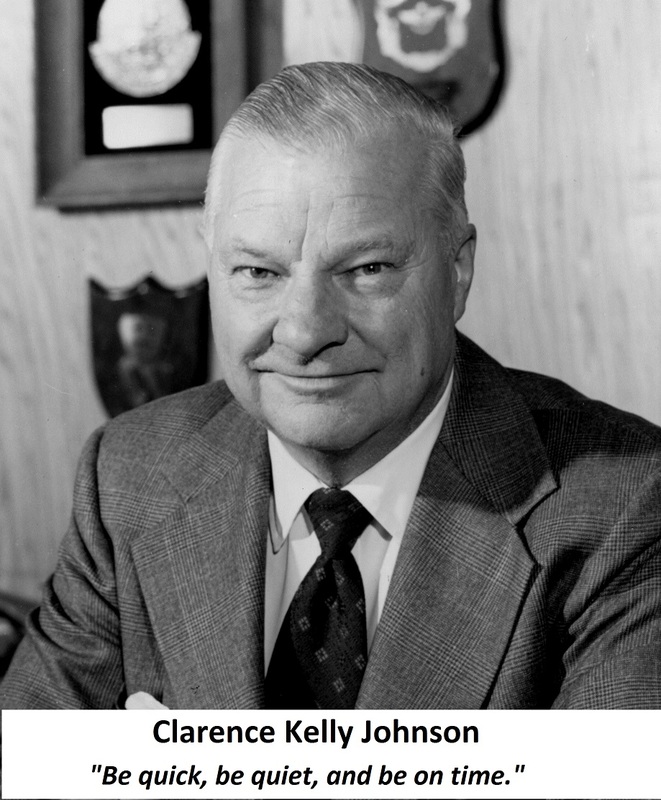 Skunk Works was run using "Kelly's 14 Rules"
Clarence "Kelly" Johnson was the first team leader of Skunk Works and designer of the P-80, U-2, SR-71 and many more. He is described as being an "organizing genius". Strong but small project offices must be provided both by the military and industry. The number of people having any connection with the project must be restricted in an almost vicious manner. Use a small number of good people (10% to 25% compared to the so-called normal systems). A very simple drawing and drawing release system with great flexibility for making changes must be provided. There must be a minimum number of reports required, but important work must be recorded thoroughly. There must be a monthly cost review covering not only what has been spent and committed but also projected costs to the conclusion of the program. Don't have the books 90 days late, and don't surprise the customer with sudden overruns. The contractor must be delegated and must assume more than normal responsibility to get good vendor bids for subcontract on the project. Commercial bid procedures are very often better than military ones. The inspection system as currently used by the Skunk Works, which has been approved by both the Air Force and Navy, meets the intent of existing military requirements and should be used on new projects. Push more basic inspection responsibility back to subcontractors and vendors. Don't duplicate so much inspection. The contractor must be delegated the authority to test his final product in flight. He can and must test it in the initial stages. If he doesn't, he rapidly loses his competency to design other vehicles. The specifications applying to the hardware must be agreed to well in advance of contracting. The Skunk Works practice of having a specification section stating clearly which important military specification items will not knowingly be complied with and reasons therefore is highly recommended. Funding a program must be timely so that the contractor doesn't have to keep running to the bank to support government projects. There must be mutual trust between the military project organization and the contractor with very close cooperation and liaison on a day-to-day basis. This cuts down misunderstanding and correspondence to an absolute minimum. Access by outsiders to the project and its personnel must be strictly controlled by appropriate security measures. Because only a few people will be used in engineering and most other areas, ways must be provided to reward good performance by pay not based on the number of personnel supervised.